Thought you were supposed to use bullnose tile for the trim. 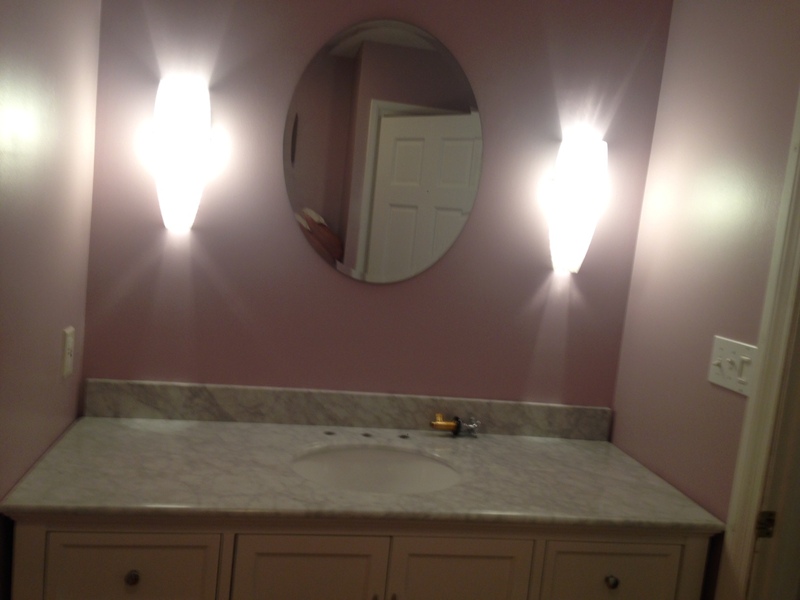 I have a tile counter vanity and hate it. It's next on the list of rooms to renovate. Why would you put tile on a vanity? Starter home so it's a cookie cutter home. Wall was bowed so was lots of fun trying to get the lines straight. Originally there was a oak trim but I've been changing it to white. The trim went around the bottom of the vanity as well. The vanity I stained (gel stain) to the mocha color. I pulled off the trim under the vanity (it goes to the floor) and was wondering if I should replace it with white trim or the tile trim. I think for the whole room I'm going back to white wood trim instead of floor matching tile. The bullnose tile for the trim is the exact color as the floor tile. I'm planning on painting the room a light gray but was wondering if it's too much gray. I was thinking the same LOL. 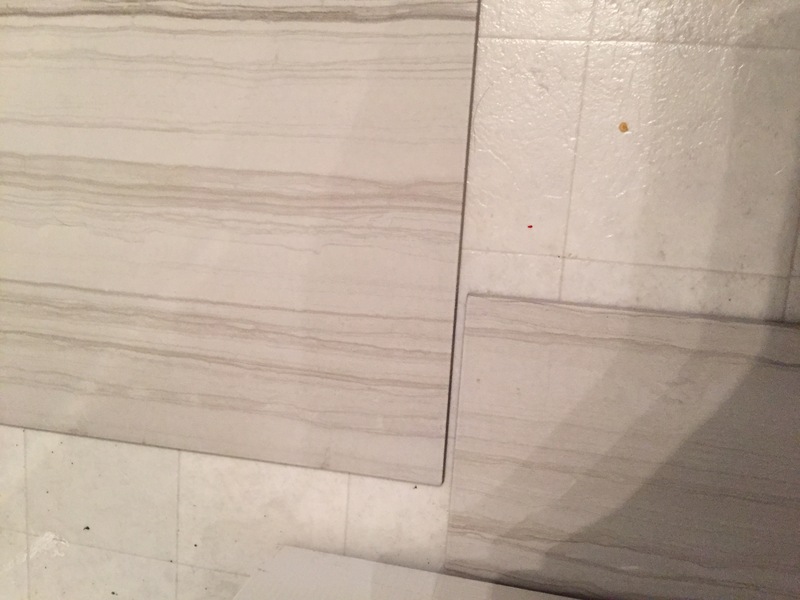 We have the same tile except yours is grey where mine is brown, for now my paint is still the same ugly color from when we moved in but I plan on going more towards matching the lightest color on the tile rather than the darkest. 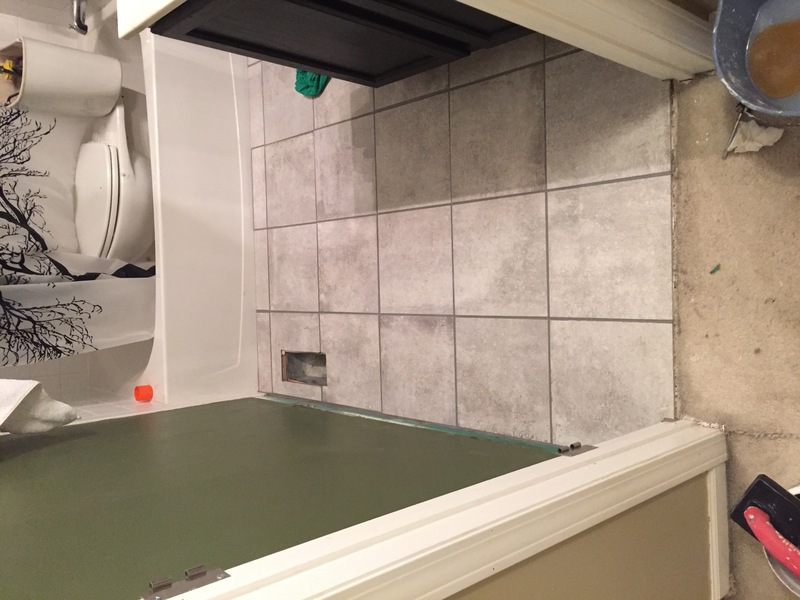 I think it would be too much grey especially after you have the baseboard tile in place, and especially if your grout is that dark after drying. Ever since I've moved the toilet into the shower I have saved over 7 minutes of getting ready. It's like a full body bidet. I agree the gray and white tile with matching tile baseboard and gray walls might be much. The only break up I would have would be white wood trim. 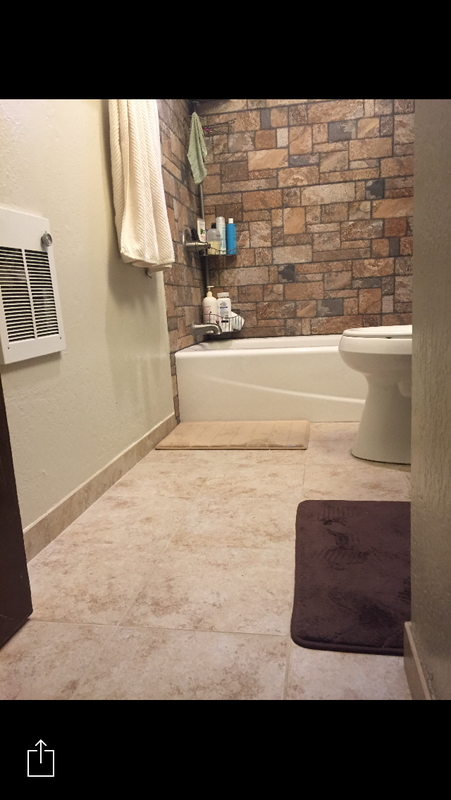 I'm not sure which is more modern or cleaner, tile or wood baseboard. Or should I go full rota and tile the entire ******* wall. I could call my dad. These were my first tile choices but size and thickness kinda killed the idea. You dodged a bullet, the larger the tile the more critical it is that everything is straight and level. Enjoy the new *******, the feeling of stepping out of the shower onto real tile instead of linoleum will give epic amounts of satisfaction every time, great way to start the day. It's been nearly a year and those feels still never get old. That's the 2nd bath. I never use it. I will be tiling my bath in a few, just gotta finish these least few steps with this one before moving to the next. Trying to decide if I should just reuse the same tile as I plan on selling the place. Yes. I would reuse the same tile..
Ah yes, I also know that unfulfilling feel of doing the one you don't actually use first. Made the kitchen gorgeous on the other half of the duplex, mine is still chilling pleb status. It's next. Use the same tile, same grout, same everything. Has anyone ever had 2x4's delivered from lowes? I was planning on getting them in several trips but have about 150-200 more to go and figured it might be easier to have them delivered. If it makes any difference, lowes is 1.5 miles from my house. Edit: it's $60 for the delivery charge. order 25% more and return the ones that aren't straight. Cool. Will finish up this 2nd bath and use the same tile for the master bath. Now time to paint and do the trim.... wood or tile... tile or wood. Good call. Luckily my ceilings are low so only need 2x4x92's. 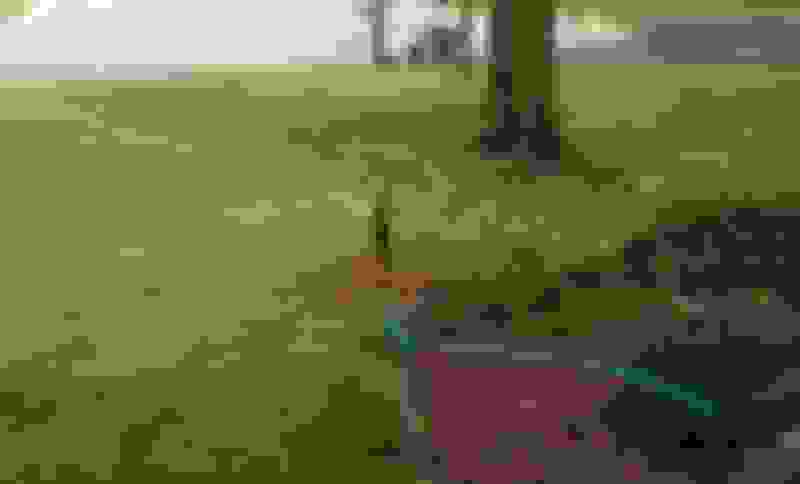 Also had the landscaping place come out to talk about mowing/general lawn service, as well as treating the driveway etc to make it look like someone actually lives here. Turns out they did all the work for the previous owners as well so they're very familiar with the house. 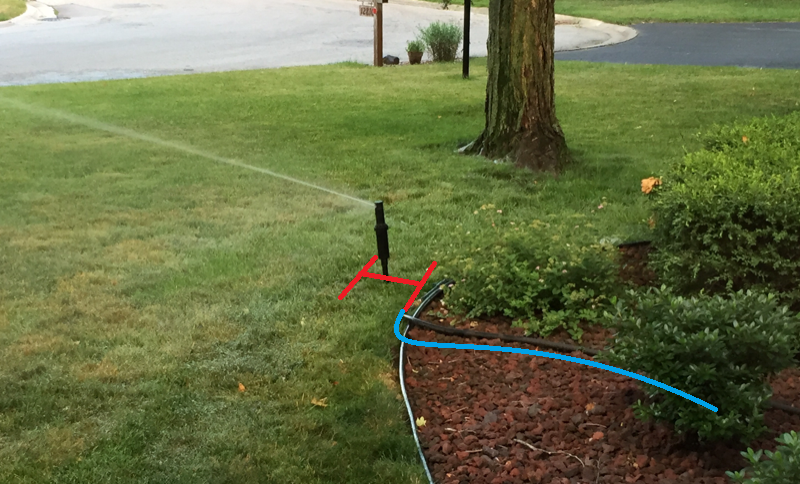 Their sprinkler guy is coming out next week to see what the system needs so hopefully he knows the house as well. Looks good. 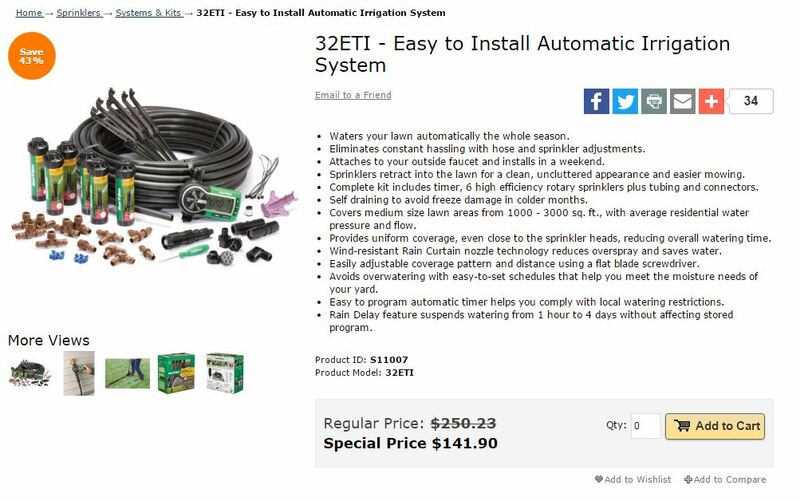 I was thinking about a sprinkler system the other day but a peasant version. Right now I drag the hose and set up my little sprinkler in the evenings. My front yard is very tiny but I like it to look phenomenal. 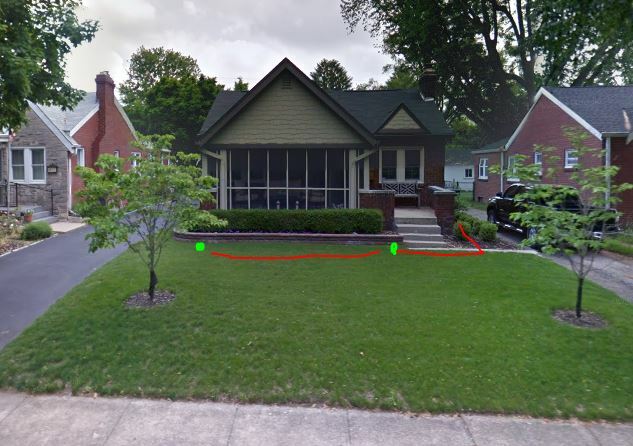 Front of the house faces west so the sun drills it from noon till the evening and parts are hard to keep green. Takes a good amount of water. Was thinking of piecing together an extremely small system with Rainbird, looks pretty cheap and just T it off my outdoor spigot. Here is their kit but I think I can do it cheaper since I'd only need 2 heads in the front (not going to do the back). Just have to tunnel under a small walk way. Green is where I'd want the heads and red is the underground. Spigot about 15-20 ft down around the corner. Do you have a spigot on the other side of the house by chance? I don't and that would be most ideal. I'd have to drill through the brick to get one over there. I will have a manablock installed soon when I call them back out so it can have a dedicated line as well. You can buy just the heads at menards/home depot for like $12. My dad buys them and connects them to a PVC "H" shape and just runs the hose to the bottom of it. I'd run a spigot to the other side of the house too. I have 4 water lines going over my basement ceiling right now no scare. Mine is copper doe. I don't really even need the timer. I can just run out and turn it on when I want. Just need the connector, sprinkler heads and plastic pipe. Timer itself is only $40. I could be in this for sub $100.